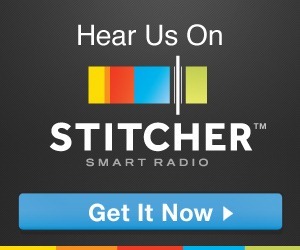 The Vegas Video Network has just been added to the Stitcher Smart Radio line up. 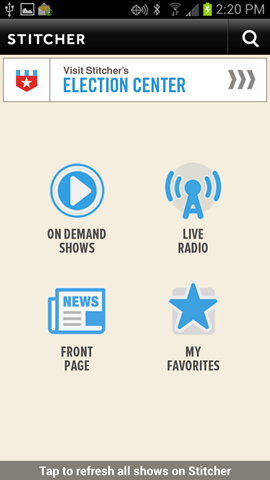 With their free mobile app, you can listen to your favorite VVN show directly on your iOS or Android device, anytime and anywhere. All episodes are available and no syncing is needed. . .no storage or memory is required to download an episode as well. I was able to listen to the latest edition of Talktails a couple days ago, while driving in my car, streaming on-demand. VERY COOL STUFF. 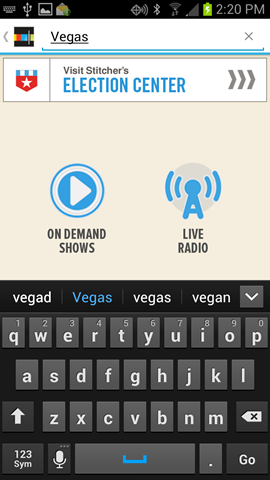 To find the shows from VVN, simply search for “Vegas” from the Stitcher home page. You’ll find our shows listed toward the top of the result page. Select the show you want to listen to and easy, peasy 1, 2, threezy, you’re good to go. 1. From the home page. . .
2. Enter “Vegas” in the search field. 3. From the results. . .
4. Select the show of your choice. LAS VEGAS, NEVADA / NEW YORK, NEW YORK – December 14, 2011 — The VEGAS VIDEO NETWORK®, the first and only live online broadcasting network in Las Vegas, today announced it has exceeded 1,000,000 (One Million) Total Viewer Minutes of live streaming content over the course of the last 75 broadcasting days. Since switching to Livestream.com as the network’s world-wide Content Delivery Network, the Vegas Video Network has reached over 100,000 unique viewers in 150+ countries during this same timeframe. These number do not include the video- and audio-on-demand downloads available for every show on the network via iTunes, VegasVideoNetwork.com, Roku, YouTube and other content-delivery partners. Livestream streams more than one billion video minutes each month to a growing community of 20 million monthly viewers. Content partners include The New York Times, ABC News, HBO, NASA, and The Academy Arts. "We continue to be very impressed with the content being delivered by the Vegas Video Network," said Jessica Kantor, head of content and marketing for Livestream, "Their ability to continue to develop and deliver shows that pull back the curtain on Las Vegas is outstanding." The VEGAS VIDEO NETWORK® (VVN) is the first and only LIVE, online broadcasting and media network that specializes in insider news and expert views about Las Vegas. We develop and produce all-original programming that is predicated on input and participation from our fan base. All programming is broadcast live from our eleven-camera capable, all HD studios, just steps from the Las Vegas Strip. Shows currently on-air include Talktails, Living in Las Vegas, Golf & Other Fore-Letter Words, Pub Crawl, Top of the Food Chain, Awkward Silence 2.1, Vegas SportsDay, and Getting REAL (Estate) in Vegas. The VEGAS VIDEO NETWORK is a YouTube Partner, available on iTunes, Livestream and Roku, and can be heard on AM 1400 KSHP. The network is owned and operated by PodWorx, Inc., an Internet broadcasting company that specializes in podcasts, Web TV, and live streaming video productions. Livestream is the leading provider for real time event coverage. Our tools make it simple for anyone to broadcast live to the web, and Livestream.com is the destination for the top live content from around the world. Event organizers, content owners, celebrities and artists around the world use Livestream’s social broadcasting tools to engage and grow their audiences on the web, mobile devices, and connected TVs. The result has been more than one billion video minutes streamed each month to the growing community of 20 million monthly viewers. Live content can be found from our many content partners. A small selection of our partners include Facebook, The New York Times, ABC News, CBS News, Associated Press, HBO, PepsiCo, Electronic Arts, Adidas, The Academy Awards, Warner Bros. Records, and Paramount Pictures. Livestream offers a unique commitment to protecting the rights of its producers through a ‘Zero Tolerance on Piracy’ policy. Livestream operates with over 120 full-time staff members in 3 offices – in New York, Los Angeles and Bangalore (in addition to a globally-available production team). Livestream Adds VEGAS VIDEO NETWORK as "Featured Live Channel"
LAS VEGAS, NEVADA / NEW YORK, NEW YORK – September 6, 2011 — The VEGAS VIDEO NETWORK®, the first and only live online broadcasting network in Las Vegas, today announced that Livestream, the leading provider for real time event coverage, has added the network as a “Featured Live Channel”. Beginning immediately, all VEGAS VIDEO NETWORK programming will be prominently featured on the home page of the Livestream website. Additionally, the network will be featured in a variety of upcoming event promotions as well. This demonstrates another first for any Las Vegas-based media company, and continues to demonstrate the network’s focus on making it as easy as possible for its viewers to discover and enjoy the wide variety of programming the network offers. In a test during the August 30th, 2011 live stream of the Living in Las Vegas Podcast, the show was visited by 801 unique viewers. Taking advantage of the ability to embed Livestream content in any webpage, the Livestream feed of the VEGAS VIDEO NETWORK can be found at http://VegasVideoNetwork.com/LIVE. It is also available at http://Livestream.com/VegasVideoNetwork. The VEGAS VIDEO NETWORK® is the first and only online LIVE broadcasting and media network that specializes in a behind-the-scenes look at insider news and expert views about Las Vegas. All programming is broadcast live from our eight-camera, all HD studios, just steps from the Las Vegas Strip. Shows currently on-air include Talktails, Living in Las Vegas, Golf & Other Fore-Letter Words, Pub Crawl, Top of the Food Chain, Awkward Silence 2.1, Let’s Bet!, and Getting REAL (Estate) in Vegas. The VEGAS VIDEO NETWORK is a YouTube Partner, available on iTunes, Livestream and Roku, and can be heard on AM 1400 KSHP. The network is owned and operated by PodWorx, Inc., an Internet broadcasting company that specializes in podcasts, Web TV, and live streaming video productions. LAS VEGAS, June 13, 2011 — The VEGAS VIDEO NETWORK®, the first and only live online broadcasting network in Las Vegas, announced today that its entire lineup of programming will be syndicated on Las Vegas radio station AM 1400, KSHP. ‘Vegas Video Network Friday Night Features’ will broadcast from 6:00PM to 10:00PM every Friday, beginning June 17th. The VEGAS VIDEO NETWORK® is the first and only online LIVE broadcasting and media network that specializes in insider news and expert views about Las Vegas. All programming is broadcast live from our eight-camera, all HD studios, just steps from the Las Vegas Strip. Shows currently on-air include Talktails, Living in Las Vegas, Golf & Other Fore-Letter Words, Pub Crawl, Top of the Food Chain, Awkward Silence 2.0, Let’s Bet!, and Getting REAL (Estate) in Vegas. The network is owned and operated by PodWorx, Inc., an Internet broadcasting company that specializes in podcasts, Web TV, and live streaming video productions. KSHP Radio, AM 1400 is home to the Most Amazing Show on the Radio – The Radio Shopping Show!® The Radio Shopping Show airs daily from 7-9am and 1-6pm plus weekends from 9a-12pm. KSHP is the station that helps you “Live Large for Less®” by saving listeners up to 80% off of great area businesses. For more information about the Radio Shopping Show, just visit www.kshp.com. KSHP Radio is owned by Las Vegas Radio Company, Inc.
SANTA BARBARA, CALIFORNIA and LAS VEGAS, NEVADA, May 19, 2011 — Vegas Mate, an award-winning application for iPhone, iPod touch and iPad, today announced that it has added VEGAS VIDEO NETWORK programming to the recently released 3.1 version of the application, available now in the Apple iTunes App Store. Users are able to watch VEGAS VIDEO NETWORK content easily on their devices, wherever they may be. Vegas Mate is an award-winning application for iPhone, iPod touch and iPad that provides a location-aware city-guide for Las Vegas tourists. With content from popular local freelance journalists, Vegas Mate combines expert opinions and user reviews, photos, restaurant and show schedules, news information and more, all in an easy-to-use package. Vegas Mate is produced by RateVegas, a popular Las Vegas ratings and review Web site operating since 2000. Vegas Mate 3.1 is $1.99 USD (or equivalent amount in other currencies) and available worldwide exclusively through the App Store in the Travel category. The VEGAS VIDEO NETWORK® is the first and only online LIVE broadcasting and media network that specializes in insider news and expert views about Las Vegas. All programming is broadcast live from our eight-camera, all HD studios, just steps from the Las Vegas Strip. Shows currently on-air include Talktails, Living in Las Vegas, Golf & Other Fore-Letter Words, Pub Crawl, Top of the Food Chain, Awkward Silence, Let’s Bet!, and Getting REAL (Estate) in Vegas. The network is owned and operated by PodWorx, Inc., an Internet broadcasting company that specializes in podcasts, Web TV, and live streaming video productions. VEGAS MATE is an award-winning application for iPhone, iPod touch and iPad that provides a location-aware city-guide for Las Vegas tourists. With content from popular local freelance journalists, VEGAS MATE combines expert opinions and user reviews, photos, restaurant and show schedules, news information and more, all in an easy-to-use package. VEGAS MATE is produced by RateVegas.com, a popular Las Vegas ratings and review Web site operating since 2000.